Transferred by the University City Associates, Incorporated (hereafter referred to as UCA) through the Division of Institutional Real Estate in 1994 (accession 1994:19), 1996 (1996:30), 1997 (1997:30), and 1999 (1999:77). The collection has been divided into five series: Board of Directors, 1963, 1982-1990; Administration, 1977-1992; Property files, 1975-1995; Financial Records, 1965-1991; Construction, 1987-1990. The Administration and Construction series are arranged alphabetically by subject. The Property files are arranged in two sections, the first by the original property code assigned by the UCA and the second alphabetical by property name. The UCA filing system designated properties by two alphabetical codes- “U” for University-owned properties and “UCP” for UCA-owned. This system broke the files down into small groups designated by letters where “a.” stood for appraisals, “b.” for acquisition information, “c.” for Budgets, “d.” for financing, “e.” for general, “f.” for leases, and “g.” for reports, proposals, and plans. The Board of Directors and Financial Records series are arranged chronologically. In November 1963, a group of people termed “friends” of the University of Pennsylvania, that included a few senior administrators of the University of Pennsylvania, formed University City Associates, Incorporated (UCA). The corporation was created as a for-profit stock company whose mission was primarily to locate and develop interim student housing around the University campus. Formed during the University’s largest period of expansion in West Philadelphia, the UCA was devised as a more rapid and less expensive means to acquire and develop property than the Redevelopment Authority of the City of Philadelphia (hereafter referred to as RDA). It was also hoped that the UCA could assist the RDA and the University by acquiring properties before speculators would quickly buy land and sell it to the RDA at very high price, particularly in the area of the Hamilton and Harnwell House dormitories (Urban Renewal Area Unit 4). In March of 1964 the University entered into an agreement with the UCA in which it would be entitled to the right of first refusal in purchasing any stocks which went up for sale. After signing this agreement insuring the University’s interest, the trustees voted to assist in the capitalization of the UCA by extending a low-interest demand loan. From the 1960s to the early 1980s, UCA was primarily involved in managing supplemental residential housing for students and faculty as well as managing some commercial properties in University City and West Philadelphia. Among the major purchases during this period were Chestnut Hall at 3900-06 Chestnut Street in 1981/82, Spruce Hall at 4141 Spruce Street in 1967, Sprucewood Apartments at 4105 Spruce Street in 1969, Surray Hall Apartments at 329 S. 42nd Street in 1965, and the Marlyn Hotel at 4001-03 Walnut Street in 1965. In addition to these properties, the UCA acquired the former Philadelphia Divinity School at 42nd and Locust Streets in 1977 which was leased to a number of educational organizations. 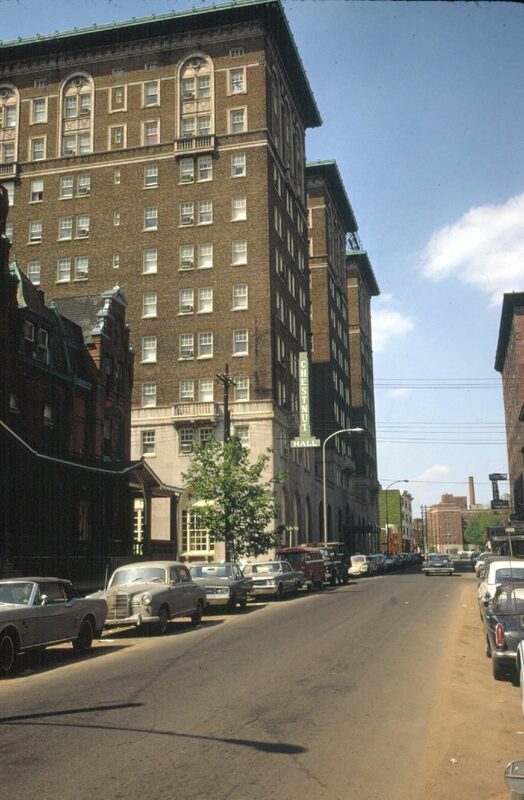 Throughout most of this period the daily operations of the UCA were conducted by the real estate firm of Hertzfeld Associates, who also managed much of the commercial and residential space owned by the University such as the Berkshire Apartments at 4101-03 Spruce which was acquired in 1967. With the reorganization the management of University property in 1985 by creation of the Department of Real Estate, later called the Division of Institutional Real Estate, the University took direct control over the UCA. The process of expanding control by the University began in 1982 when the University purchased all the outstanding shares of private investors and continued into the following year when several University trustees joined the board of the UCA. In March 1985, the process was completed with the election to the UCA board of the University’s Director of Real Estate as well as the Senior Vice-President, Vice-President for Finance, and Treasurer. The Department of Real Estate gradually took direct control over the management of UCA properties. By 1992, the UCA no longer needed the services of Hertzfeld Associates. During the 1980s and 1990s, the UCA has continued to purchase and manage properties for benefit of the University. It has provided office space for a number different units of the University of Pennsylvania as well as supplemental housing for students. In 1997 the University entered into a property management agreement with Trammel Crow Higher Educational Services, Inc. for all its facilities and property. The Division of Institutional Real Estate turned over most of the UCA property management functions to Trammel Crow. In 2000 the corporation was converted from a for-profit to a not-for-profit tax-exempt corporation. The collection documents the real estate business investments and opportunities of the UCA, since the late 1960s. The Board of Director and Administration series documents the transition of the UCA from an independent corporation to the integrated unit of the University of Pennsylvania from 1982 to 1992. The minutes of the board of directors as well as their agendas and reports detail this process. These series also contain various letters, financial reports and drafts of agreements regarding the property management of the UCA. The property files trace the transactions on many of the properties the UCA has offered for lease during the 1980s and early 1990s. This series contains lease agreements signed between the UCA and tenants, administrative correspondence, some construction or maintenance records, and miscellaneous financial records including City of Philadelphia tax documents. Among the properties represented here are the former Episcopalian Philadelphia Divinity School, Walnut Mall, Chestnut Hall, Spruce Hall, University City Shopping Center, 133 South 38th Street, 3424 Sansom Street, and 3910 Chestnut Street. There are also appraisal reports of all the UCA properties held in 1985, some of which include photographs of the buildings. The financial record files document the income and management of the UCA from the late 1960s to the early 1990s. They include general ledgers, cash disbursement journals, financial statements, and tax returns. There is also a representative sample of the detailed rental monthly statements of income and expenses for the UCA residential properties in 1991. The construction files have information regarding the conversion of 4126-38 Walnut Street into an office building in 1989. There are correspondence, plans, construction meeting minutes, proposals and estimates. The researcher should note that due to the interrelated nature of the UCA with the Division of Institutional Real Estate since 1985, there is often some UCA-related material in the records of the Division of Institutional Real Estate (UPH 20). Hertzfeld Associates, Inc. (Philadelphia, Pa.). University of Pennsylvania. Division of Institutional Real Estate. University of Pennsylvania. Office of the Treasurer. Dept. of Real Estate. 1988, Managed Properties, Monthly Reports, Urban Developers Inc.